As thrifters, resellers, and crafters life is a never-ending cycle of diabolical messes and frantic cleaning. Destroy. Clean. Destroy. Clean. Rinse, Repeat. After doing this for years I've mastered the art of speed cleaning. And I mean really cleaning- not just my half-assed toss the mess in the closet trick. But I do recommend designating one closet your "junk closet" for emergencies. It's handy! In the middle of an overly ambitious book purge. Tea was needed. Lots of tea! Quickly toss anything littering your counters into a box. If you have time, sort these items into their proper places. If not, set the box aside to sort later. Dust and polish your freshly cleared counters. Dust the items you've decided to keep on display. Here's where you'll wash any dishes and scrub toilets or tubs as needed, too. Shake out your rugs, sweep your hardwood or tile floors, and vacuum where necessary. Once all that's done, mop the whole house. 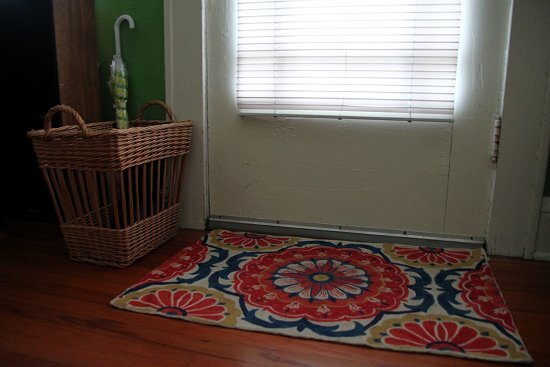 Keep a basket by the front door to deposit your shoes upon entering. Perhaps keep a little catch-all (like a pretty vintage plate) where you can drop keys and pocket change. Put things away as soon as you're done with them, clean messes as soon as you make them. Do this and there will never be a pile of dishes in the sink or craft messes all over the tables. Getting tired of tagging merchandise, editing a blog post, or checking e-mail? Take a break and organize one small section of the home, dust, or tackle the dishes. What my pad ends up looking like in the middle of an ambitious purge. Aaaah! Kill it with fire! Less stuff means less cleaning, so donate and sell away! 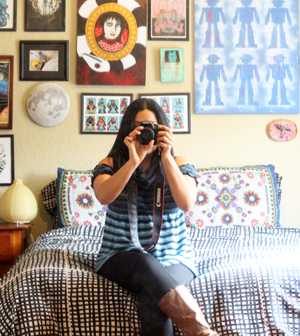 See: Thrifter's Decluttering Guide: Sell Your Trash for Cash. Be careful with what you bring home at the thrifts after your home purge. This year I'm going to mop and dust every Tuesday and Friday. Schedule deep cleaning every few months where you'll clean windows, dust ceiling fans, dust floor boards, and really scrub down the pad. Take everything out of your drawers and closets at once and you'll burn out. 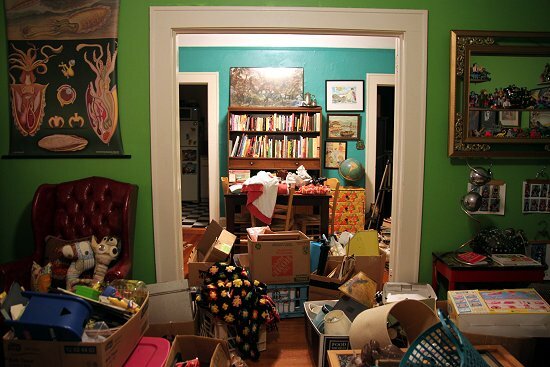 Your home will stay messy for weeks on end. Instead, organize your house one box and section at a time. 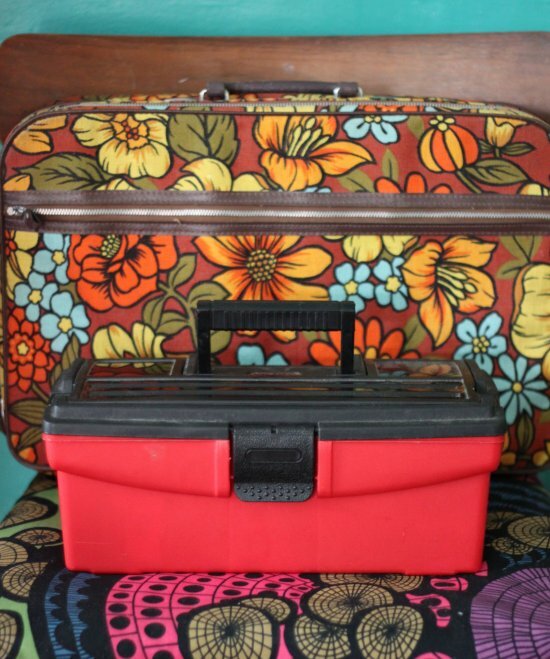 These two boxes contain sewing and craft supplies I use frequently. 10. Keep frequently used items accessible. My drawers and cabinets only contain the items I use daily. Less frequently used items are stored out of the way. I like to use vintage baskets and suitcases to store frequently used supplies, too. Using these methods I can always thoroughly clean the house after a busy day of destroying it! So play some fast-paced music and give your house a quickie. You'll both be spent and satisfied. Oh yes. "Kill it with fire!" - ha! And thanks for reminding me about those two closets shoved full of things that I had to get out of the way quickly (months ago) when guests were coming to stay. Eartha Kitsch: I'll get back in that less stuff phase one day soon, still working at it. Until then, I love your ten evening clean-up tip! There is a method to your madness! I just finished swapping places with my to list collectibles and my sewing notions and my studio looked like your pad for a couple of days. Now I can easily reach my sewing notions, yeah. For some reason, I categorized my collectibles into boxes by use or room, bed and bath, vases, figurines, kitchen, etc. Currently my dining room table is a battleground of on-going projects. Last night I managed to get it down to a dull enough roar to actually eat at it. Boy, did I feel accomplished! Victoria: I'm trying to organize craft/frequently used supplies in a clever way. There will be a bit of chaos in the meantime! LOVE this post! I'm going to put this all to use once I get back to my dorm! Sunday Goals Week Five: Time to Buckle Down! Why Thrift Core? My Thrift Story. Thrift Haul: Who Wants to Play Scrabble?